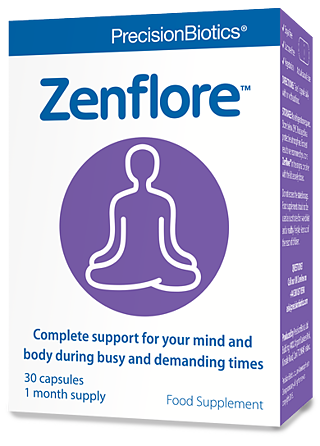 Zenflore supports your mind and body during busy and demanding times. With its unique 1714-Serenitas® culture and specially selected B vitamins, Zenflore reduces fatigue and aids mental performance*. The 1714-Serenitas® culture is a naturally occuring bifidobacterium, part of the family of bacteria given by mother to baby at birth2. However, not all bifidobacterium are equal and research is increasingly showing that the effects of bacteria are strain specific.There are thousands of different bifidobacterium strains each with their own unique properties . In a similar way, house cats and tigers are part of the cat family but with very different properties. When choosing a strain it is important to choose one whose properties are understood, that has been clinically studied and is supported by scientific evidence. The 1714-Serenitas® culture in Zenflore was discovered and developed by PrecisionBiotics®, in partnership with scientists and clinicians from one of the world’s leading centres of research on the human gut and microbiome, the APC Microbiome Institute at University College Cork, Ireland. Zenflore is available in many pharmacies throughout Ireland, usually on the digestive care or vitamins shelf. If Zenflore is not on the shelf, the pharmacy can order it and will usually receive it the next day. If you have any questions on Zenflore or about trying it, please contact our Careline on 021 206 6012 or ask@precisionbiotics.com. PrecisionBiotics is an Irish company and part of the Alimentary Health Group. Zenflore was discovered in Ireland. Available now at your local pharmacy or healthfood store. Over 17 years ago, our scientists began researching thousands of bacterial cultures together with experts from one of the world's leading centres of microbiome research. Our PrecisionBiotics are unique bacterial cultures that we have discovered, developed and then rigorously tested, including in human clinical trials, to ensure they have the precise qualities needed and that they meet our rigorous standards. All our products contain bacteria that occur naturally in the human gut and are at home there. 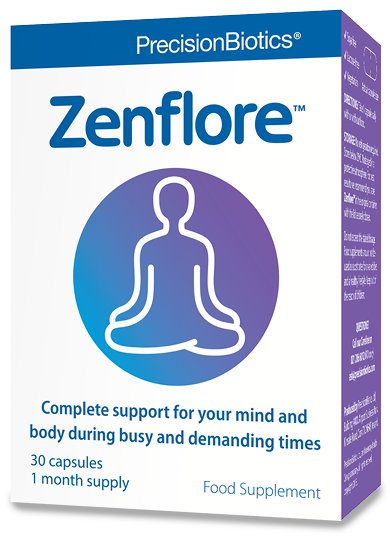 Zenflore contains the 1714-Serenitas® culture which has been clinically studied1 and selected B vitamins*, which contribute to mental performance, reduction of tiredness and fatigue*. Zenflore is not a medicine and is not a substitute for any medication prescribed for you by your doctor. Do not discontinue any medication without consulting your doctor. *Pantothenic Acid: Contributes to normal mental performance; Biotin, Folate, Niacin, Thiamine, Vitamin B12, Vitamin B6: Contributes to normal psychological function; Folate, Niacin, Pantothenic Acid, Riboflavin, Vitamin B12, Vitamin B6: Contributes to the reduction of tiredness and fatigue; Biotin, Niacin, Pantothenic Acid, Riboflavin, Thiamine, Vitamin B12, Vitamin B6: Contributes to normal energy yielding metabolism. References: For further detail on the items cited in this article, please click here. We are a company that is dedicated to harnessing the best of nature's friendly bacteria to help consumers and clinicians all over the world. We're proud of our record of discovery and our partnership with one of the worlds leading centres of gut microbiome research to test and develop world-leading probiotics.